Yoga sequence to help find inner peace at Christmas! Take a comfortable seat. If needed prop your buttocks with a pillow or block so the knees can drop below the hips and the low back can relax. Relax your left palm comfortably into your lap and bring your right hand just in front of your face. Block right nostril with your thumb. Breathe in through the left nostril. Block left nostril with your ring finger. Release the thumb and exhale though the right nostril. 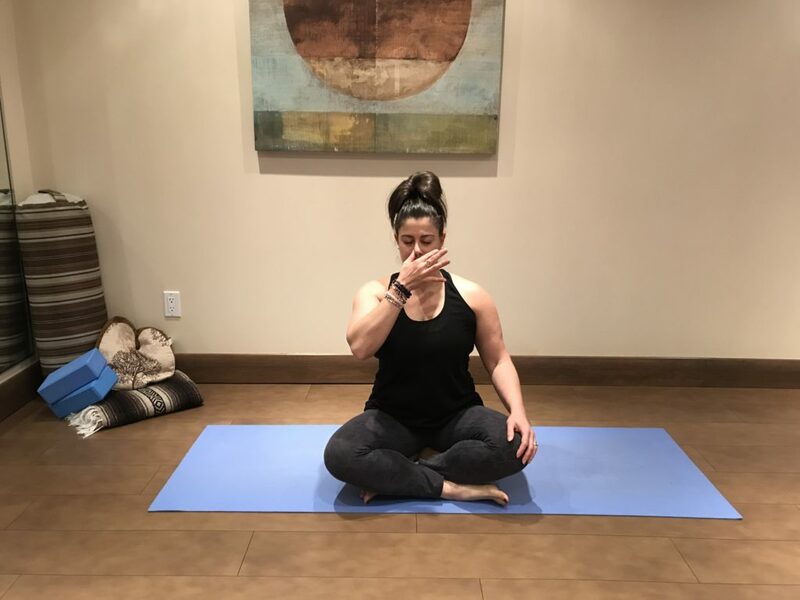 Inhale through the right nostril, block with the thumb, lift ring finger and exhale through the left nostril. Repeat 5-10 cycles. A full cycle begins with an inhale from the left nostril and ends with an exhale on the left. Maintain your focus by following the rhythm of the inhale and exhale. 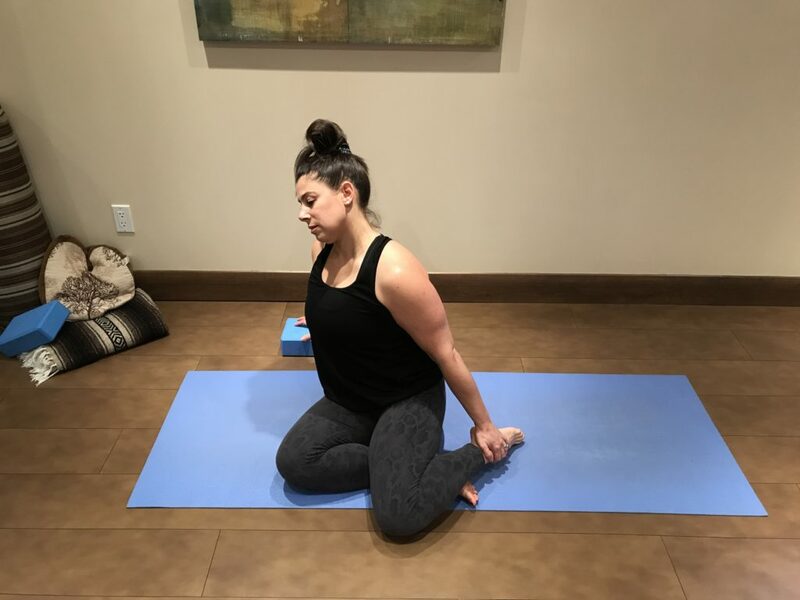 This strong and centering pose opens the hip flexors, chest and shoulders, while opening the heart and developing strength and courage. Turn your right foot so your toes point to the top of the mat and the left back foot to 45 – 60 degrees to the left. Align the right heel with the left instep. Square the front of your pelvis as much as possible with the front edge of your mat. As the left hip draws forward, tilt the pelvis down slightly and press into back leg to ground the outer edge of the back foot. Raise your arms overhead with palms facing one another. Bring your palms together, bend at the elbows and bring your thumbs to the space between your shoulders. Elbows point upward to the ceiling and draw in towards one another. Keep your head in a neutral position, gazing forward, or tilt chin up and gaze at ceiling. Inhale to breath into front body, Exhale to root into the earth. Creates a solid foundation and strong container to release and expand into, while stimulating digestive organs and calming the mind. Turn your right foot so your toes point to the top of the mat and the left foot 60–75 degrees to the left. Align the right heel with the back left foot. Reach both hands behind back to either clasp hands, forearms or place hands into reverse prayer position. With feet flat on your mat, hug your legs toward one another, as if you were squeezing a block between your inner thighs. Inhale and actively lengthen your spine. Exhale and begin to hinge at the hips, extending your torso long over your front leg. Stop when your torso becomes parallel with the floor, or at the point when your lower spine begins to round. Strongly press both feet into the mat, drawing your right hip back so that the leg lengthens. Take care not to let your right hip swing out to the right side. Pause here and breathe. If you have the flexibility, you can fold deeper over the front leg, but keep your spine and side bodies long. Hold for 5 rounds of breath. To release, press both feet down firmly into the mat, bring a slight bend in your front knee and bring your hands to your hips. 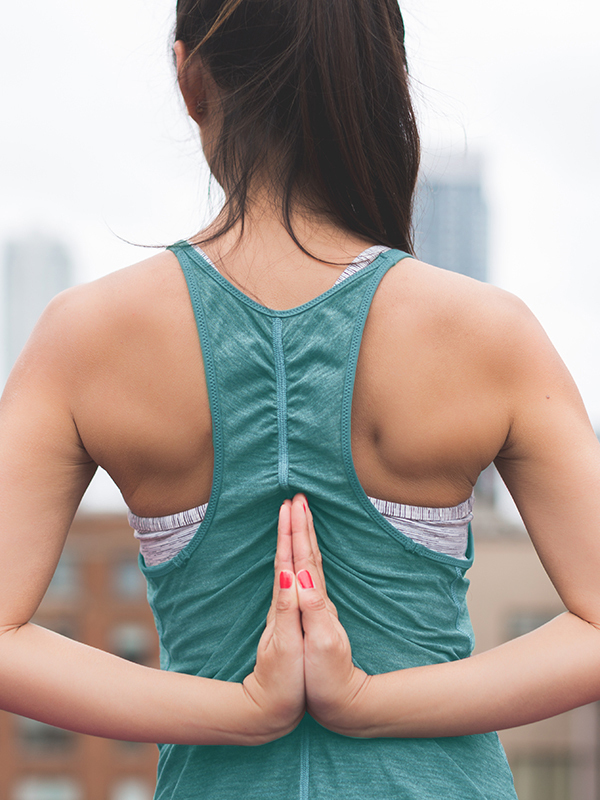 Inhale and rise to stand with a flat back. 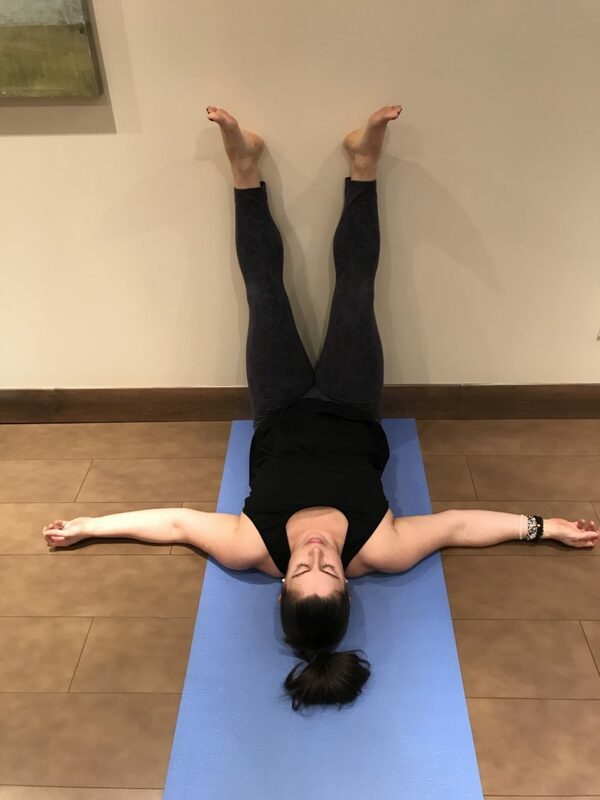 This resting pose is calming for the mind and great for digestion, while elongating the lower back and opening the hips. Come to table top on your mat. Choose to either open the legs in a V position or keep legs together. Extend your arms to the front of the mat, anywhere from shoulder to mat width. Choosing the width that best suits your shoulder mobility and/or neck health. Place your forehead (or “Third Eye”) to rest gently on the mat. Blocks or cushions may be used for support should the head not touch. Take 10 rounds of breath to open and direct light and energy into lower back, kidneys and adrenal area to nurture self-care and healing. Lengthens and twists the spine and neck, providing a release of tension and promoting a sense of peace. Sit on your mat bending both knees to the right and feet to the left. Shif weight to right while still anchoring left buttock into earth. 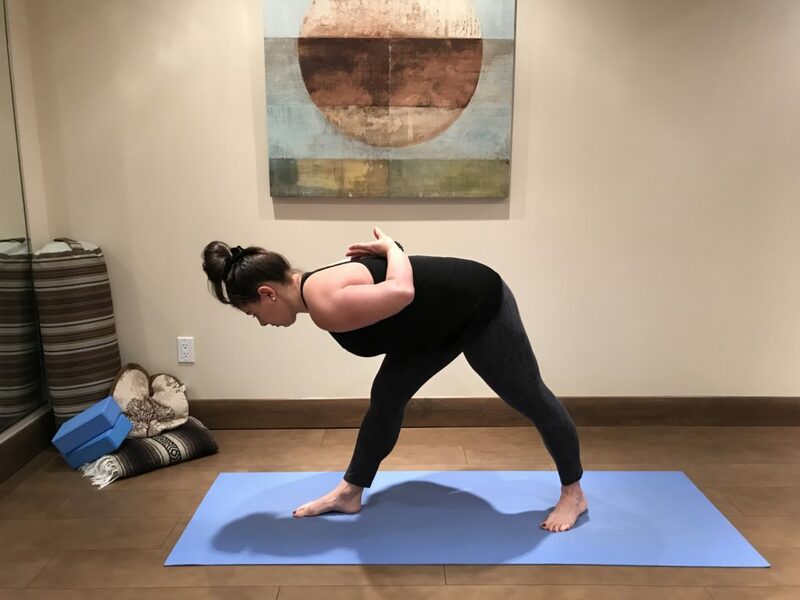 Rotating from the hips toward the right, place the right hand comfortably on the floor or a block to anchor and connect. Be mindful to maintain space between the shoulders and ears. Now reach left hand to left, wrapping your fingers around the shin or foot, creating traction along the left side of body. Gently drop your right ear towards the right shoulder. 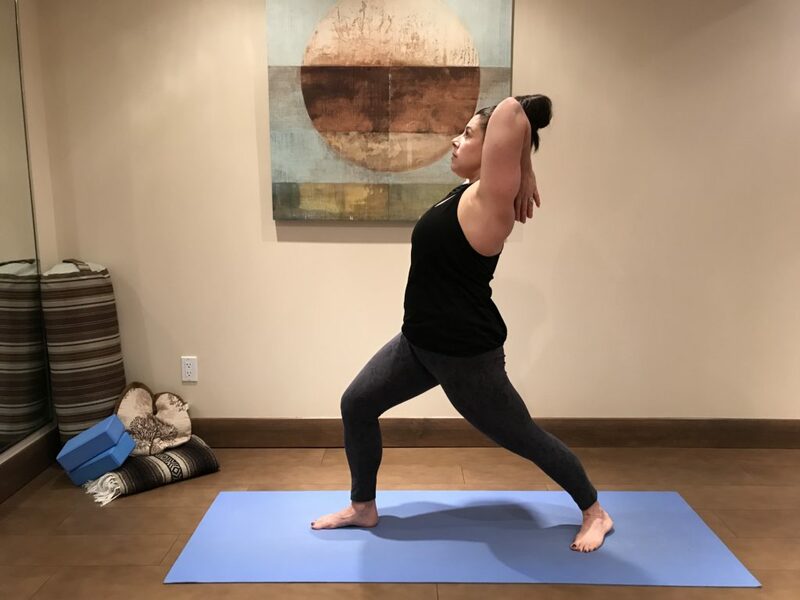 Explore your best expression of the pose to allow for a deep but comfortable opening in the neck, down the shoulder and arm. Hold for 10 rounds of breath. Gently release and pause and then repeat on other side. Position the short side of mat against wall. Lie on your back with your sit-bones as close to the wall as is comfortable for you. Extend your legs up the wall, so that the backs of your legs are resting with knees soft. Adjust the placement of your seat in relation to the wall, depending on the flexibility in your legs. It’s important that the legs be able to relax. If you have any lower back pain, support your body by placing a yoga block or folded blankets on the ground beneath your back. Keep a gentle arc in your torso from the pelvis to the top of the shoulders. If your neck feels strained, place a small, pillow or rolled-up towel under it. You may cover your eyes. Rest your arms out to your sides. 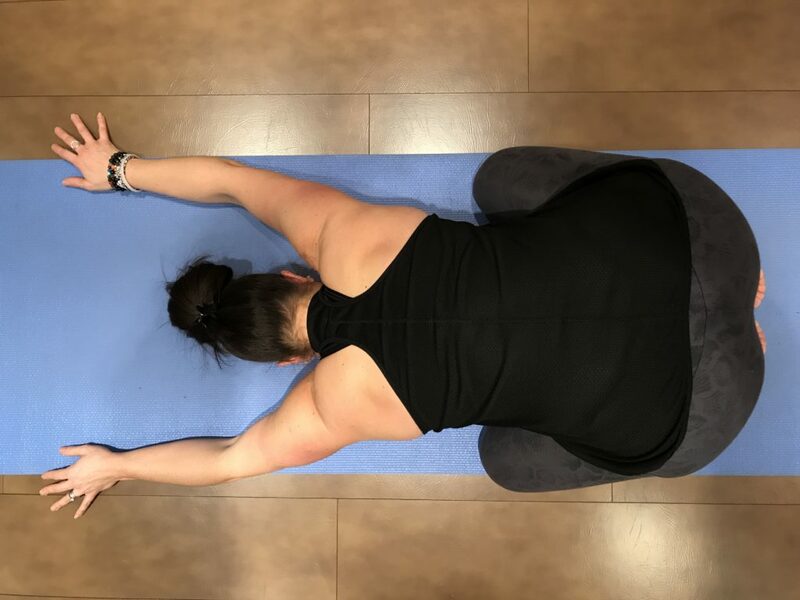 Open your shoulder blades away from the spine, relaxing your hands and wrists. Release the weight of your belly toward the floor. Soften your eyes and turn your attention towards your heart center. Settle into Legs up the Wall for 5 to 20 minutes. Set a timer so you don’t have to think about watching the time. To come out of the pose, bend your knees toward your chest. Roll onto your right side and rest a moment. When ready press your hands into the floor and find a seated position, letting your head come up last. Sit quietly for a few minutes and feel the effects of your practice.